Audi 100 C3 Automatic Gear Selector Plate. Donor Car: 1988 Audi 100 C3 2226cc. The New and Used Audi Parts Specialist for all Audi models worldwide. Audi Part Number: 444 713 109 J. It may fit others. Donor Car: 1997 Audi S6 C4 Avant 2226cc Quattro Sport. The New and Used Audi Parts Specialist for all Audi models worldwide. Audi Part Number: 4A2 713 109 K. It may fit others. Years, engine1986m., 0kw, 1800cc. The carAudi 100, 200, 5000 (C3). Transmission & Drivetrain. We are always willing to work out any problems. An item that has been previously used. Item will be sold as it is shown in the pictures. Automatic gearbox lock Solenoid that attaches to the side of the gear selector stick. Removed from a final edition audi 80 cabriolet 2.6 v6 auto. In good working condition. Typ 4A - C4; Audi 100 (1990–1994); Audi S4 (1992–1994); Audi A6 (1994–2001); Audi S6 (1994–2001). Typ 85 - B2; Audi Coupé (1980–1987); Audi 4000 / Quattro (1981–1987); Audi Quattro (1981–1991); Audi Sport Quattro (1984–1987). The New and Used Audi Parts Specialist for all Audi models worldwide. Donor Car: 1997 Audi 80 Cab 2771cc. Audi Part Number: 893 927 353 B. It may fit others. You must be 100% sure that item you are buying fits to you. For almost every item the PART NUMBER(S) is added. Typ 85 - B2; Audi Coupé (1980–1987); Audi 4000 / Quattro (1981–1987); Audi Quattro (1981–1991); Audi Sport Quattro (1984–1987). Typ 81 - B2; Audi 80 / 90 / 4000/ 5 5 (1979–1987). Typ 89Q - B3; Audi 80/90 quattro (1987–1992). Wood effect gear knob, made from the highest quality materials to ensure long lasting. Important notice: The compatibility chart above is for guidance only. NOT suitable for automatic vehicles or if you have the lift up reverse function. UNIVERSAL DSG AUTOMATIC GEAR KNOB COVER. Colour Red. Easy Installation, Flexible Fit. Excludes scottish highlands, ireland & northern ireland. Important notice: The compatibility chart above is for guidance only. NOT suitable for automatic vehicles or if you have the lift up reverse function. Carbon design gear knob, made from the highest quality materials to ensure long lasting. UNIVERSAL DSG AUTOMATIC GEAR KNOB COVER. Colour Black. Easy Installation, Flexible Fit. Excludes scottish highlands, ireland & northern ireland. Typ 80: B1;Audi 80(1972–1976). Typ 81: B2; Audi 80 / 90 / 4000/ 5 5 (1979–1987). Typ F104: C1;Audi 100 (1968–1976). Typ 82/33: B1;Audi 80 / Fox(1976–1978). Typ 43: C2;Audi 100 (1976–1982). Typ 85: B2;Audi Coupé / Quattro / Sport Quattro (1981–1987). Audi A3 8V. Shift knob / shift lever. Leather shift knob. Part number, whether the shift knob suitable to your vehicle is.". Accident-free VW / Audi vehicles. Collection of goods is course also possible. 20-PIN distributor adapter cable wiring harness plug & play for VW Audi seat factory radiosEUR 7.95. Premium Mini 5cm short Rod Rod antenna black car radio for many vehiclesEUR 5.85. Premium Mini 3cm short Rod Rod antenna black car radio for many vehiclesEUR 5.85. Steering column switch. Bumper bar. XENON SUPER WHITE HALOGEN BULBS 6000 K HB4 E - TEST SIGN 12V 55WEUR 8,85. XENON SUPER WHITE HALOGEN BULBS 6000 K H11 E - TEST SIGN 12V 55WEUR 8,95. XENON SUPER WHITE HALOGEN BULBS 6000 K H8 E - TEST SIGN 12V 35WEUR 8,95. 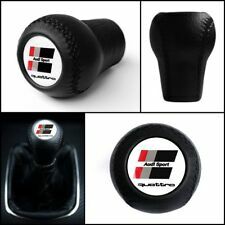 Black Imitation Leather Gear Shift Knob UNIVERSAL. Not suiatable for lift up reverse! Original VW Audi seat SKODA PDC sensor Park sensor 1S0919275C 4 H 0919275 3 C 0919275EUR 14,85. PREMIUM faux leather seat cover seat covers seat covers car covers black action34,85 EUR. Steering column switch. Years, engine2010m., 100kw, 2000cc. The carAudi A5. Interior Parts. Transmission & Drivetrain. Warranty on electronic devices is void if identifying mark is removed or has sign of tampering. We are always willing to work out any problems. 479313: used used Audi 100 Gear stick - gear shift lever 1993. 479313: used used Audi 100 Begiu perjungimo rankena (svirties burbulas) 1993. 479313: used used Audi 100 Schaltknauf Schaltgriff Schalthebel 1993. Leatherette shift knob black UNIVERSAL. für AUDI 80 100 200. Not compatible for lifting reverse gear! including mounting kit. Getriebeart Manuell. Oberflächenbeschaffenheit Chrom. Farbe Schwarz. For Audi A3 8 p A4 8E A6 4F Q7 2 x LED light lights Kit CANBUSEUR 13,85. 5-speed version ! Note: The list of vehicles using only serves to rough comparison purposes and is often not sufficient for accurate accessories and spare parts provision. Pump heads. Exclusive Edition gear knob fits many vehicles! 12mm (only then the knob is due!). Motor- & Chiptuning. Armrest leather arm rest for original breakpoints Audi A3 S3 8 p from 2004-10EUR 59,85. 470250: USED USED Audi 100 Gear stick - gear shift lever 1993. 470250: USED USED Audi 100 Begiu perjungimo rankena (svirties burbulas) 1993. 470250: USED USED Audi 100 Schaltknauf Schaltgriff Schalthebel 1993. PREMIUM faux leather seat cover seat covers seat covers car covers black action34,85 EUR. Steering column switch. Bumper bar. XENON SUPER WHITE HALOGEN BULBS 6000 K HB4 E - TEST SIGN 12V 55WEUR 8,85. XENON SUPER WHITE HALOGEN BULBS 6000 K H11 E - TEST SIGN 12V 55WEUR 8,95. Close more back. close more. Certoplast car tape tape tape 15 mm 50 m for VW AUDI BMW MBEUR 7.65. USB MP3 AUX CD changer adapter interface 12 p for VW radio RCD 300 310 500 510EUR 41,85. USB SD MP3 AUX CD changer adapter 12-pin for VW radio RCD 100 200 210 215EUR 41,85. 1x Accessory Set. PREMIUM 4-ply car garage full garage cover tarp breathable garage carEUR 27,75. Carmotive wire. Marten cover. MFL multi function steering wheel. For Audi A3 8 p A4 8E A6 4F Q7 2 x LED light lights Kit CANBUSEUR 13,85. Premium loading edges protection foil scratch protection carbon black for many vehiclesEUR 7.85. not For vehicles with reverse gear (RGA) or automatic transmission! Leather in the sports hole leather design. Exclusive Edition gear knob fits many vehicles! Exclusive Edition in 6-speed shift knob design suitable for many vehicles! 12mm (only then the knob is due!). -Height shift knob approx. Armrest leather arm rest for original breakpoints Audi A3 S3 8 p from 2004-10EUR 59,85. Ergonomic shift knob in white elegant quilted faux leather with black stitching. Suitable for almost all vehicles without reverse gear lock (RGA). Shift knob - 200882. Wind Deflector. UNIVERAL for all vehicles without a RGA (reverse locking). Check the part number carefully. Used, fully functioning car part. Parts have a quarantee for 3 months. Is this the right part for my vehicle?. Audi A8 D3 Aluminium Gear Selector Trim. Donor Car: 2003 Audi A8 D3 3700cc Quattro Sport. The New and Used Audi Parts Specialist for all Audi models worldwide. Audi Part Number: 4E2 713 111 A. Donor Car Colour: Bodywork is Silver LY7W. Audi A8 D3 Aluminium Gear Selector Trim. Donor Car: 2005 Audi A8 D3 3000cc Quattro Sport. The New and Used Audi Parts Specialist for all Audi models worldwide. Audi Part Number: 4E2 713 111 A. Donor Car Colour: Bodywork is Silver LY7W. Audi A8 D3 Aluminium Gear Selector Trim. Donor Car: 2003 Audi A8 D3 4000cc Quattro Sport. The New and Used Audi Parts Specialist for all Audi models worldwide. Audi Part Number: 4E2 713 111 A. Donor Car Colour: Bodywork is Black LZ9W. Audi A8 D3 Aluminium Gear Selector Trim. Donor Car: 2004 Audi A8 D3 3000cc Quattro. The New and Used Audi Parts Specialist for all Audi models worldwide. Audi Part Number: 4E2 713 111 A. Donor Car Colour: Bodywork is Grey LZ7Q. Audi A8 D3 Aluminium Gear Selector Trim. Donor Car: 2003 Audi A8 D3 4200cc Quattro. The New and Used Audi Parts Specialist for all Audi models worldwide. Audi Part Number: 4E2 713 111 A. Donor Car Colour: Bodywork is Blue LY5X. Audi A8 D3 Aluminium Gear Selector Trim. Donor Car: 2005 Audi A8 D3 3000cc Quattro. The New and Used Audi Parts Specialist for all Audi models worldwide. Audi Part Number: 4E2 713 111 A. Donor Car Colour: Bodywork is Blue. Audi A8 D3 Aluminium Gear Selector Trim. Donor Car: 2004 Audi A8 D3 4200cc Quattro. The New and Used Audi Parts Specialist for all Audi models worldwide. Audi Part Number: 4E2 713 111 A. Donor Car Colour: Bodywork is Grey LZ7R.